A whale watching boat, from a distance, watches one of several transient killer whales during a whale watching trip last month. Patrons watch transient orcas on a 12-passenger Maya's Legacy Whale Watching boat last month, after departing from Friday Harbor. Sandstrom founded the Seattle-based nonprofit The Whale Trail, in partnership with several state and regional agencies and organizations, in 2008. It includes more than 100 sites for whale watching from British Columbia to California, aimed at building community and stewardship around orcas and other marine life. For Sandstrom, watching from shore is the least invasive way to admire the iconic killer whales, especially the Southern Resident population that’s teetering on the edge of extinction. And it’s free. Still, many people associate the breathtaking experience with whale watching boats, a prolific industry in the Pacific Northwest that’s been under heavy scrutiny in recent months. In the second part of our series “Two Views: Whale Watching in the Pacific Northwest,” KNKX environment reporter Bellamy Pailthorp heads to San Juan Island to try out whale watching by boat. Jeff Friedman, U.S. president for the Pacific Whale Watch Association, says his industry is misunderstood. That indescribable feeling he’s witnessed as a captain for Maya’s Legacy Whale Watching in Friday Harbor creates lifelong advocates for the survival of endangered orcas. A deep bench of stakeholders are working statewide and over the Canadian border to save the dwindling population of Southern Resident orcas, whose numbers have dropped to 75 across three pods. The rate of successful births is suffering, and experts are cautiously optimistic about the odds of survival for the most recent calf born to the L pod — nicknamed Lucky — as well as the unborn calves from two pregnant females, one each in J and K pods. People walking along The Whale Trail in Seattle watch for Southern Resident orcas in December. The nonprofit provides binoculars, donated by REI, for viewing from shore. But to guarantee the species stays here in perpetuity, scientists stress that drastic steps must be taken now. And not everyone agrees on what those immediate steps should be. Among the most controversial items proposed by the orca recovery task force, convened last year by Gov. Jay Inslee, was a de facto ban on whale watching. The proposal has since been stripped from the long list of recommendations. Lawmakers are still considering a bill — one of many moving through the Legislature — to limit the boats’ distance and speed around the whales, among other regulations. It would increase the required distance between boats and the whales: 300 yards alongside the orcas and 400 yards in front of or behind them. Additionally, it would create a “go-slow zone” of 7 knots when boats travel within half a nautical mile of the whales, among other vessel-specific mandates. The proposal is still moving through the Legislature. Proponents are optimistic, as budget proposals in both the House and Senate have allocated funding. Sandstrom and Friedman both served on the task force. Friedman says a hyper-focus on vessels is misguided. He says the emphasis should be salmon recovery. 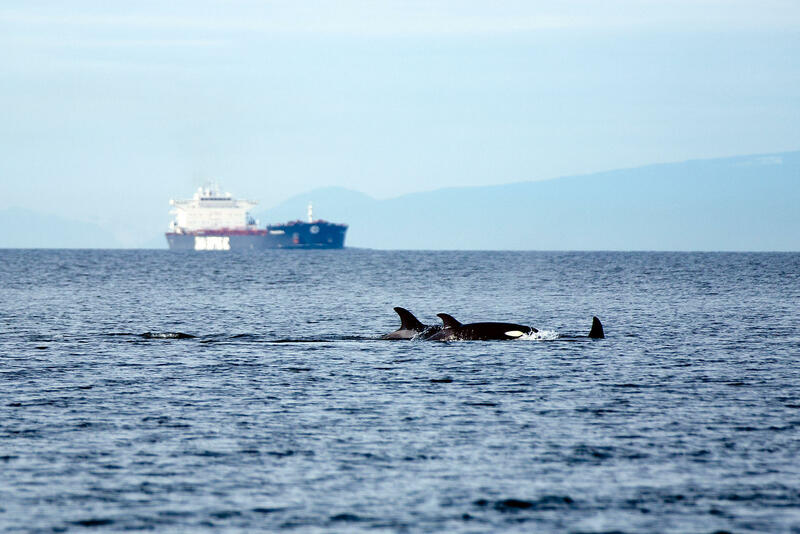 While Sandstrom agrees, she also says it’s important to reduce noise created by vessel traffic — including whale watching boats — so the endangered orcas can hear one another as they hunt for food while it remains scarce. Transient orcas swim by a tanker in the Salish Sea near Friday Harbor during a whale watch last month. 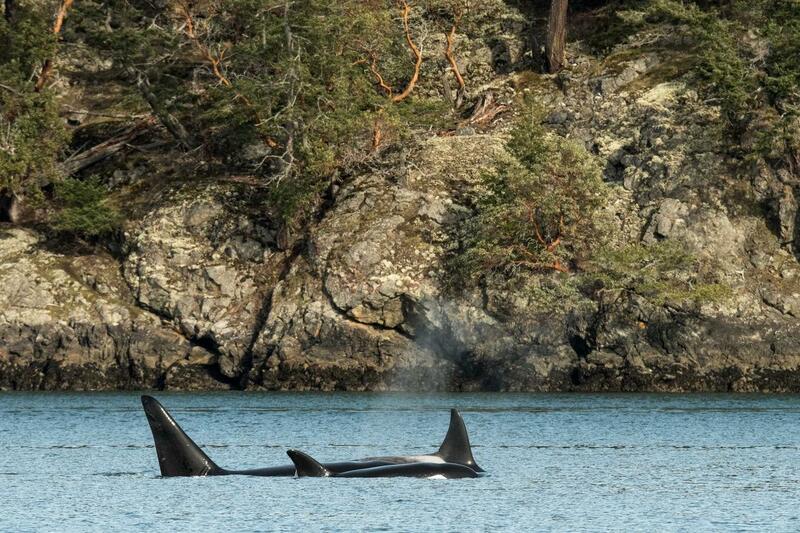 Orcas are always on the move, so finding them on the shore or on the water is a fluid process. Because the whales travel roughly 50 to 100 miles per day, Friedman said, locating them can be challenging. Sandstrom, on a crisp winter day, stressed to a group of viewers in West Seattle that orcas use the whole of Puget Sound. So, people can even see the whales in urban areas, not just the waters of the San Juan Islands where most people think to go whale watching. “This is really important habitat to them,” she said from the shores of Seattle’s Alki Beach. Whale watchers in West Seattle use The Whale Trail, a nonprofit with more than 100 sites for viewing marine life from land, to watch Southern Resident whales in December. When viewing from land, Sandstrom says regular watchers start looking for the Southern Resident orcas from October to February. They make a habit of showing up frequently in December, she said. In recent years, though, sightings of the endangered Southern Resident orcas have dropped rapidly. In fact last May, for the first time on record, there were zero sightings. And Friedman’s association says the population makes up only 15 percent of the total sightings on whale watching boats. 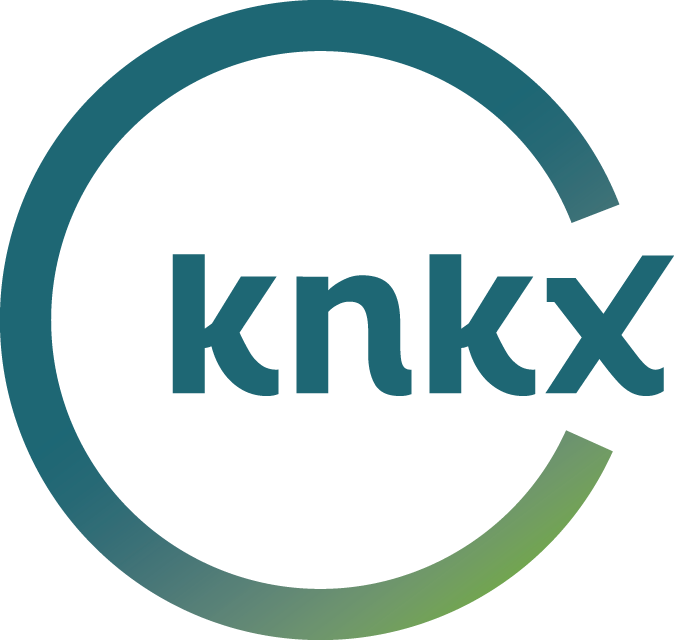 On two separate trips over the past several months, one by boat and another from land, KNKX Public Radio observed Southern Resident orcas just once — from the shore. Watching from the 12-passenger boat last month, patrons with Maya’s Legacy saw several families of transient killer whales — mammal eaters who are seen much more often, in part because of their growing numbers. The so-called Bigg’s transients are in the ninth year of a baby boom, Friedman said, and the transient population has more young whales than the entire adult population of Southern Residents. “We’re learning so much about the different families because we’re seeing them so often,” he said of the transients, following the recent whale watch. Among one of the families observed that day was Tumbo, a young male living with a spinal deformity who can’t swim as fast or hunt. Tumbo’s pod takes care of him, including hunting for his food while he floats at the surface. Transient whales swim in the Salish Sea near a Maya's Legacy Whale Watching boat in December. While Sandstrom and Friedman disagree on the means, they agree on the end: the Southern Resident orcas need our help and they need it fast. After living in the Salish Sea for thousands of years, captures in the ’60s and ’70s depleted the population to a low of 71. After the state stepped in decades ago, the whales bounced back to a high of 98. But a combination of human impacts have led to a near-all-time low once more. Friedman says the whale watching industry plays a vital role in modeling good behavior on the water, as well as assisting researchers working to learn more in an attempt to save the species. Friedman added that many of the proposed regulations discussed by the task force, especially the mandatory go-slow zone, were already supported and voluntarily advised by the Pacific Whale Watch Association. He said the association takes a proactive approach to revising guidelines, with the whales’ best interest at the forefront, and they look forward to working with the state to formalize those standards. And the energy to get it done is stronger than ever. A transient orca swims in the Salish Sea during a recent whale watching trip.